Depending on the eye disorders, Ophthalmologists and Optometrists have different methods to examine the anterior and posterior part of the eye. A circular “cut” around the optic nerve head is used to measure the thickness of the nerve fiber layer in this area. The thickness of the nerve fiber layer can provide information about the number of existing nerve fibers and any loss. The loss of nerve fibers can result in visual impairments. 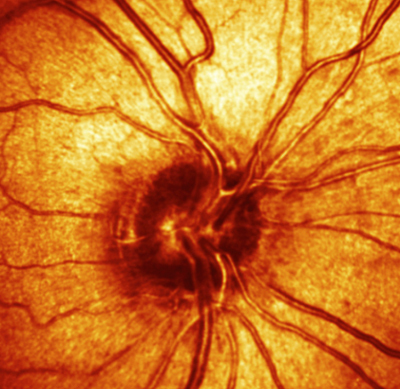 An examination with the Heidelberg Retina Tomograph (HRT) generates a three-dimensional image of the optic nerve head (location where the optic nerve exits the eyeball and goes to the brain) and the surrounding retina. These images provide information about the structure and condition of the optic nerve head. Pathological changes can be detected early and documented reliably. Regularly performed HRT examinations are useful for analysing the progression of advancing damage to the optic nerve head and the surrounding retina. 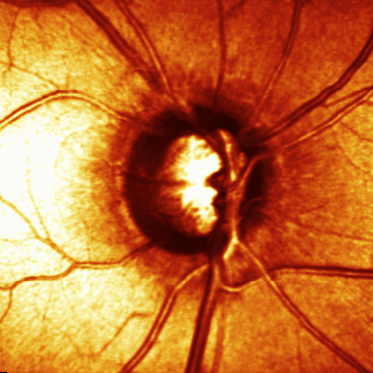 Glaucoma treatment can be adapted to the progression of the disease. Today, an HRT examination is regarded worldwide as the standard for diagnosing glaucoma, since glaucoma becomes noticeable very early through a change in the optic nerve head. The examination does not require the administration of drugs and is painless. 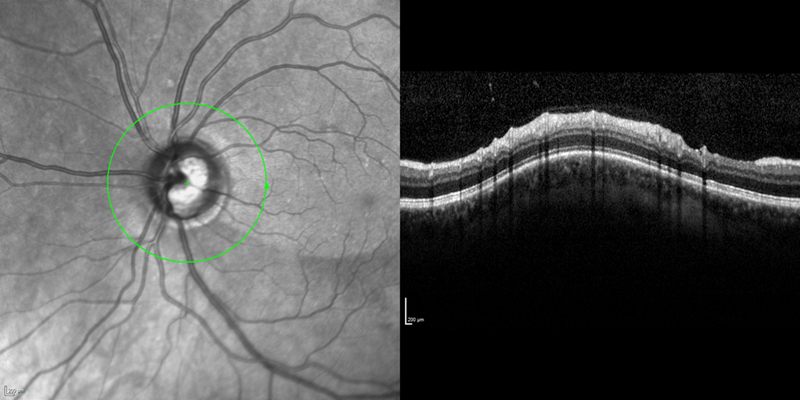 During an HRT examination, a safe laser beam scans the desired area of the retina at three different levels in seconds. A computer develops a physical profile of the tissue surface from the generated image. The generated images are three-dimensional and very high in contrast. The surface structure of the optic nerve head and the blood vessels are reproduced exactly. 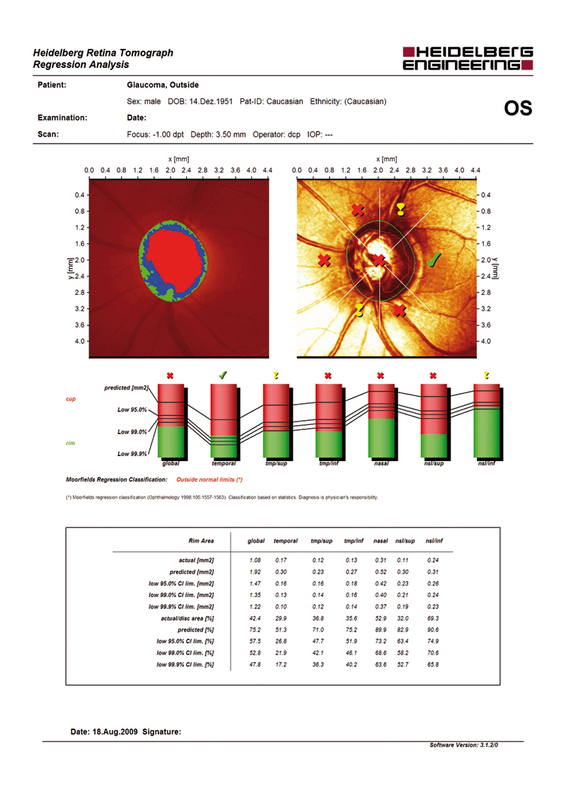 The computer automatically compares the gathered structure data of the optic nerve head with a normal database, depending on factors such as age, gender, and ethnicity. This database contains both healthy and diseased eyes. This process allows the risk of suffering from glaucoma damage to be determined individually for the examined eye. Any pathological changes can be documented early.